Looking to better serve its 115,000-plus student population, the City Colleges of Chicago system built a "data democracy," empowering all faculty and staff with a flexible reporting and analytics system. At the City Colleges of Chicago, key strategic priorities revolve around data: empowering all 5,800 employees of the college with access to a fully interactive reporting and data analytics system. These priorities came about through a widely understood need for change. The City Colleges of Chicago is a large system, with seven community colleges, six satellite facilities, a center for distance learning, a culinary institute, two owned and operated restaurants, a public radio station and a public TV station. Educating about 115,000-120,000 students each year, it's the largest community college district in the State of Illinois and one of the largest in the country, yet graduation rates had dipped to about 7 percent per year. To address these challenges, Chancellor Cheryl Hyman founded a program called "Reinvention" about four years ago. A continuously rotating group of about 100 administrators, faculty and staff came together, each for a term or two, to take on the problems of the institution. They were charged with identifying and characterizing the ways in which the organization was operating and serving its students, identifying best practices and putting positive change in motion. One of the main ideas that came out of the "Reinvention" initiative was the need for data in order to do any kind of meaningful analytics for decision-making. At the time, City Colleges did not have a data warehouse or any kind of centralized reporting system. Reports were pulled from the college's front-end PeopleSoft system, or from other shadow IT systems that had cropped up over the years. The colleges brought in Brendan Aldrich, who had worked on several data warehouses for large organizations, to lead a project to establish better access to data throughout the colleges. Aldrich focused on the idea of building a "data democracy" — so that everyone could have the data they need — and took the job of executive director, data warehousing services for the City Colleges of Chicago. Work on the new data warehouse began in November 2012. In the spirit of "Reinvention," data warehousing and analytics were put in place that would completely reinvent the way the colleges used information. 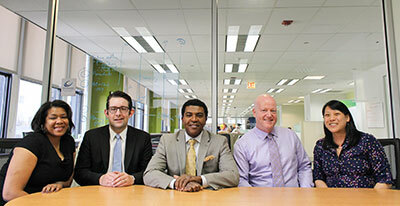 City Colleges of Chicago officially launched the system, "OpenBook", in September 2013. OpenBook's data warehousing and analytics services are built on technology from ZogoTech. The system's innovative functionality is geared toward empowering all employees: Reporting is re-invented by the elimination of "static" reports, replaced by fully interactive reports where all elements can be changed with drag-and-drop simplicity to answer evolving questions. A Student Navigator enables on-the-fly student analytics, and dynamic data environments ensure that each employee has truly relevant data across multiple roles at his fingertips. Complete data dictionaries with full definitions, samples and notes are available within every report and integrated "just-in-time" training provides on-demand videos to demonstrate OpenBook's functionality for users of all skill levels. The system is structured by "user views," so that data is filtered according to user needs, noted Nancy Lee Chavez, associate vice chancellor, decision support at City Colleges of Chicago. "If I'm a faculty member, for example, I'm seeing all the data on the students I am teaching, plus the students I have taught in the past — and I'm not just restricted to the 'past' records, as I can also have the ability to look forward and see the students I have taught and how they are doing in their current coursework." City Colleges of Chicago is now working to fully integrate OpenBook into day-to-day operations across district, college, program, department and faculty areas, with the goals of increasing student retention, accelerating student success in declared programs, facilitating progress on developmental education pathways and helping adult education/GED/ESL students transition to college-level coursework. But perhaps more than anything else, the OpenBook project has brought a renewed vision of what the colleges can be doing with data, now and going forward.